I am a HUGE advocate of IRL book clubs. So much so that I personally participate in three monthly clubs and one not-so-secret-secret book club. I know that sounds like a whole lot of reading, but I’m really passionate about reading. Now, I’m not knocking online clubs. They are great, but there is something about getting together in person to nerd out about books. Especially when there is food involved. 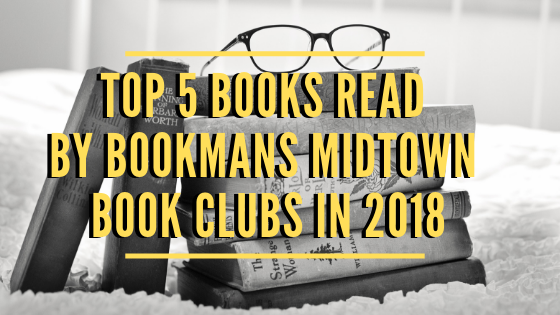 At Bookmans Midtown we have two clubs–the New Adult Book Club that meets every second Wednesday at 6:30 PM and the Backroom Book Club that meets every third Thursday at 6:30 PM. While the New Adult club does adhere to a specific genre the Backroom club is a little bit more all-inclusive. It never fails that each meeting turns into an animated discussion about that month’s read. IRL book clubs are your reading support group. If you’ve ever been wondering what types of books are read in IRL book clubs, here are five of the best books we read in 2018, in no particular order. 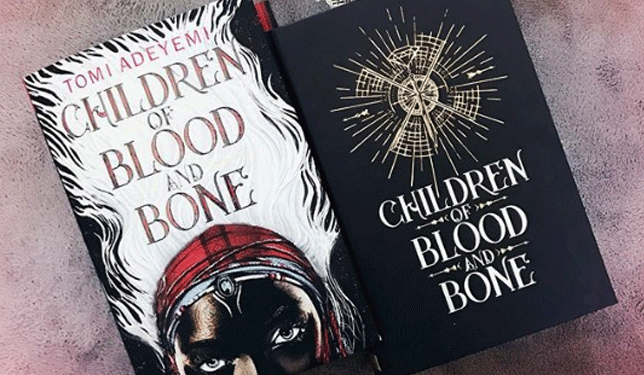 This amazing, break-thru, young adult novel follows Zélie, a child of the land of Orïsha where the Maji and magic was once something that flourished. Magic has since disappeared and the diviners, magicless Maji, are treated terribly. But a chance encounter with a runaway princess sets Zélie on the path to bring magic back. The only problem is that the monarchy knows and they’ll do anything to stop her. Your ex-boyfriend is getting married. What do you do when you’re invited? You can’t possibly accept, that would be awkward. But, you also can’t refuse to go without an excuse. Solution? Answer every literary invitation on your desk and travel the world. Did I mention you’re a sort of failed novelist? This bittersweet story follows Arthur Less as he avoids thinking about the wedding and haphazardly travels his way into his fifties and around the globe in search of himself. The world is ending. Soon. Actually Saturday. Next Saturday. If you’re listening to the prophecies of Agnes Nutter, which is, by the way, only a completely accurate book of prophecies from 1655, before she exploded. Good and Evil are getting on their war horses *cough*motorcycles*cough* and someone has misplaced the Anti-Christ. Also, there’s an angel and demon who have become accustomed to their lives on Earth and would like things not to change. Happy apocalypse everyone! Are you like me and you tend to root for the villains? Vicious is the story for you. Best friends Eli and Victor are brilliant but competitive and arrogant. When their experiments with near-death experiences prove to create unexplainable extraordinary abilities to develop it also sets them down the path of destruction. Ten years later, Victor is out of prison and determined to face off with Eli who is on a mission of his own–to eradicate the world of every person with an extraordinary ability. If your best friend since the fifth grade started acting differently, you’d assume she was possessed by a demon right? That’s exactly what happens in this supernatural horror throwback to the late 1980s. After a strange acid induced night with their friends, Abby’s best friend and favorite person in the world Gretchen starts acting all kinds of crazy and completely unlike herself. So Abby embarks on a quest to get her BFF back. Look out for some awesome 80s references and a story about the strength of friendship.